Since it was co-written by the man behind ROBOT MONSTER (1953), I really wasn’t expecting anything from this one (whose SE DVD I bought dirt-cheap from VCI outright). However, the film proved worthy of some attention  though failing to keep up the initial momentum, despite a brief 75-minute duration. The plot starts off with a typical ‘Last Man On Earth’ scenario (albeit restricted in this case to just one big American city, and the reason it’s deserted is due to evacuation rather than decimation). Eventually, a handful of people (including a constantly squabbling couple) band together in a hotel; we gradually learn their individual reasons for being left behind  which would actually be replicated in the much later THE QUIET EARTH (1985)  and, amidst fighting one another (especially the bossiness of an armed criminal on the run), they heroically withstand the alien invasion (consisting of a single solitary robot!) which is threatening the planet. 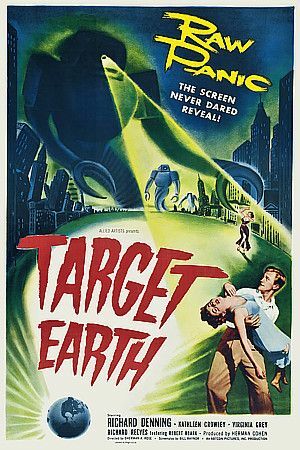 Ultimately, the military springs into action  scientist Whit Bissell having finally hit upon a particular sound wave which can ‘kill’ the clunky automaton(s), also able to shoot a deadly ray a’ la Klaatu from THE DAY THE EARTH STOOD STILL (1951)  and rescues those still standing (obviously the hero and heroine). The male lead is once again played by Richard Denning, whom I had just watched in THE BLACK SCORPION (1957): amusingly, as in that film, for all his ruggedness he’s made up to be something of a dope as well, since Denning cluelessly purports to defend himself with a mere firearm (at the end, when he’s told the alien was actually a robot, his character displays genuine amazement  duh!). In the end, though no classic, the film is extremely typical of its time and reasonably entertaining while it’s on (with, as I said, the best moments coming at the very beginning via the eerie depiction of deserted city streets). The extras are perhaps over-generous for such minor genre fare: that said, I haven’t listened to its late producer Herman Cohen’s Audio Commentary  while I was already familiar with the tribute featurette to him from its inclusion on VCI’s own edition of HORRORS OF THE BLACK MUSEUM (1959).